The Slidor app determines on its own what the end angle will be for rotating around the object being captured so that your slid ends up the best it can be. It decides this every time based on the environment that ends up in the camera lens. For this reason, even the same environment can feature different capturing angles in different attempts to capture it. However, the capturing angle can be controlled manually as well by selecting the perspective or changing the location of the objects being captured. 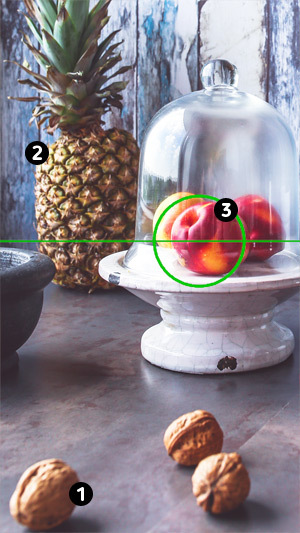 If it seems to you that the capturing angle is too large – add a foreground1 and/or a background2 into the shot relative to your central object being captured3. You will additionally be warning that they’re not there by an icon in the corner of the capturing screen while in process. However, if, on the other hand, the angle is too acute – remove the foreground1 or background2 or move them closer to the object being captured3. For both items, it’s most often best to just slightly modify the capturing perspective, meanwhile not physically moving anything. To learn more about the foreground or background for digital slids, see here; for printable slids, see here. They have their differences.